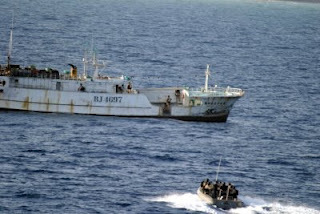 “Young boys there say they want to grow up to be pirates,” reports National Public Radio’s Gwen Thompkins from Somalia, where piracy has become a lucrative practice, despite the international community’s sporadic efforts to thwart the hijacking of ships off of Somalia’s coast. As conditions in the country continue to deteriorate, more and more Somali youth have turned to piracy to make a living. With 45 percent of the population under 15, the 2008 Failed States Index ranked Somalia as the state with the most demographic pressure (tied with Bangladesh). Somalia’s chronic poverty, political turmoil, and violence have fostered a “humanitarian nightmare,” with economic opportunity almost impossible to come by. And in Somalia, “there’s no fallback job…There is no real opportunity for people who need to make money,” turning many young men to piracy as a way to earn a living. Though piracy has only made headlines over the last year, the roots of the problem go back more than a decade. “Illegal fishing is the root cause of the piracy problem,” one Somali resident told the BBC. For years, Somali fishermen struggled to compete against illegal fishing trawlers that cost many fishermen their livelihoods. The government’s inability to enforce fishing regulations drove many fishermen to raid illegal fishing trawlers, and this vigilantism eventually became the piracy that plagues the Gulf of Aden today. Meanwhile, Somali pirates, who benefit from current lawless conditions, have been helping al Shabaab, the youth wing of Somalia’s Islamist movement, fund their insurgency against President Abdullahi Yusuf’s government. For example, according to the Telegraph, in April, al Shabaab secured a five percent cut of a $1.5 million ransom for a Spanish fishing boat and its 26-member crew. Meanwhile, al Shabaab, which the U.S. Department of State has designated a foreign terrorist organization, has become an increasing concern for U.S. military officials, who suspect the youth terrorist wing has ties to al Qaeda. As hijackings become more high-profile—such as the Ukrainian ship carrying 33 tanks, or the Saudi supertanker carrying more than $100 million in crude oil—al Shabaab fetches more from each ransom, which could be used to fund attacks against U.S. troops in Iraq and Afghanistan. In light of these possible linkages, the United States on Wednesday began circulating a draft resolution to the UN Security Council that would permit foreign countries to hunt down pirates on land, in what is a growing trend by the international community to stop pirate attacks in the Gulf of Aden. According to the United Nations, Somali pirates have netted £80 million, or more than $120 million, in ransom payments so far this year. And despite threats made by the international community, this nascent and lucrative industry likely won’t hurt for recruits. Until Somalia has a functioning government and economy that can offer youth legitimate livelihoods, piracy will continue to be a thorn in the side of the international shipping industry. Photo: A U.S. Navy rescue team provides assistance to the crew of the Ching Fong Hwa, a Taiwanese-flagged fishing trawler, which was released in November 2007 after being hijacked and held by Somali pirates for seven months. Courtesy of the U.S. Navy. 15-to-0 endorsement on Tuesday for such aggressive measures,” The New York Times reported on Wednesday. Secretary of State Condoleezza Rice also announced that the U.S. will push the UN Security Council to sanction a peacekeeping force before the end of December. But despite the threat of escalating attacks against Somali pirates on the mainland, the BBC reported three more hijackings on Wednesday, including an Indonesian tugboat, Turkish cargo ship, and a private yacht.